Manchester United have been cleared to seal the transfer of Wolves midfielder Ruben Neves after quotes from Manchester City manager Pep Guardiola. The 21-year-old star has been linked with both United and City in recent times after shining in the Premier League and showing himself to be one of the top young players in Europe. However, Guardiola has addressed transfer rumours linking City with a £100million bid for Neves, and insists that is ‘not going to happen’. 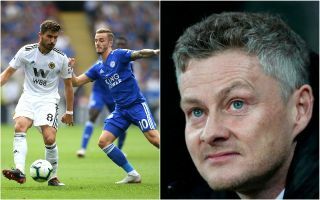 This is a huge boost for United, who have been strongly linked with the Portugal international in a big-money move in recent times, and who may be better-placed to afford the deal. The Red Devils arguably also have more of a need for Neves and the qualities he’d bring, due to a current lack of options in midfield. Fred has proven a poor signing since his summer move from Shakhtar Donetsk, while Nemanja Matic and Ander Herrera also don’t look the best long-term options in that area. If City are indeed ruling themselves out of signing Neves, United could really be in luck if they pursue the £100m man before the end of the month.